John was born in Devonport, Devon, England on 30 January 1861. He is the fourth child of James and Jane Hawkins. On the 1861 census he is shown as a two month old. His older brother and sisters are Thomas James Robinson Hawkins age eleven, Charlotte age 9, Clara age 7. His father, James, is a rigger at the AM Dock Yard in Devonport. Click here to read about his father. He is 46 years old while his mother is 41 years old. 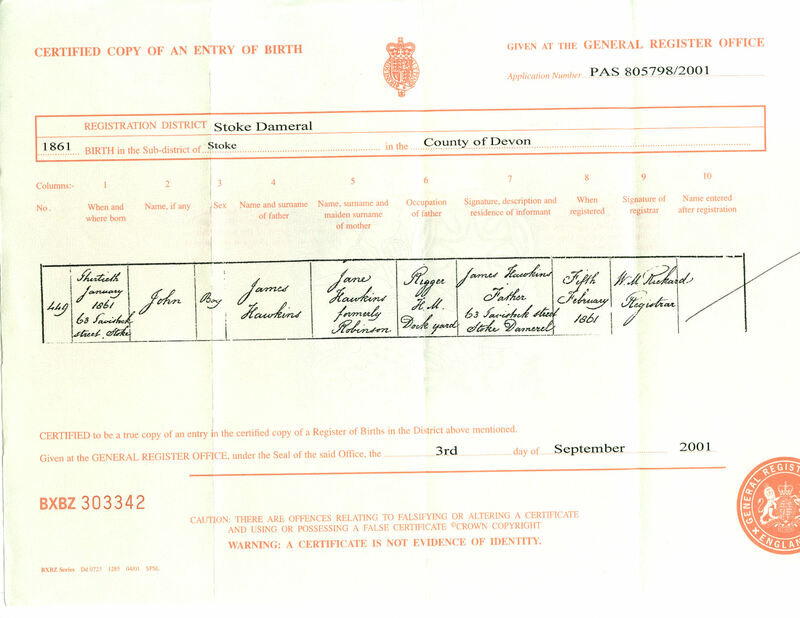 On 16 July 1861 John and his sister, Clara, are both baptized in the Parish of Stoke Damerel in the County of Devon. In 1871, John and his older brother are the only children living at home. Thomas J. R. is working as a carpenter on a ship and John is going to school. 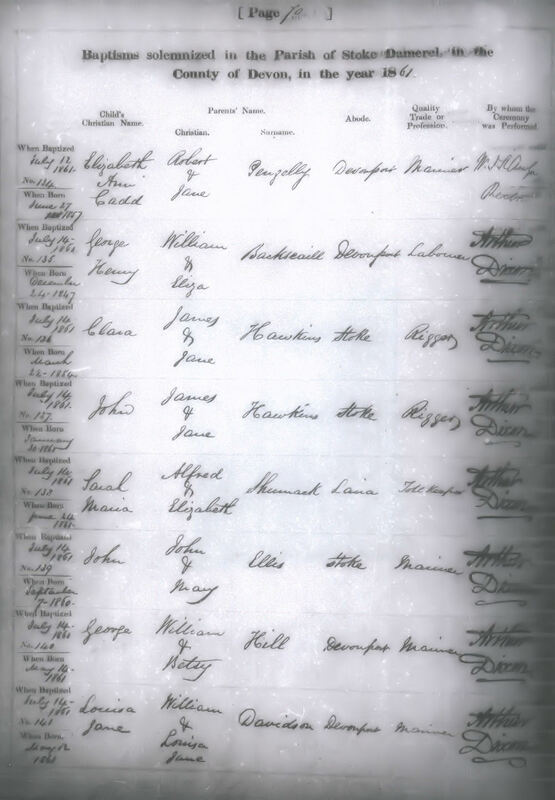 Charlotte has married Thomas Leaman in 1869 and is listed as a seaman's wife on the 1871 census while Clara is found in the hospital in Devonport. Evidently John had a great interest in art and was able to attend the Plymouth School of Art in 1879. This school has existed in Plymouth since 1851 or earlier. Many of the school records were lost in the fires that damaged the city during the blitzes of the Second World War so not too much is known of his work there. But a small sketch pad was handed down in the family with many drawings and the name of the school he attended. John also exhibited his artwork at the Royal Academy of Exhibitors in London. He had two paintings exhibited there. One painting on display was "Portrait of a Lady." The Royal Academy has exhibitions twice a year when "artists" of varying degrees of ability exhibit their work for sale. 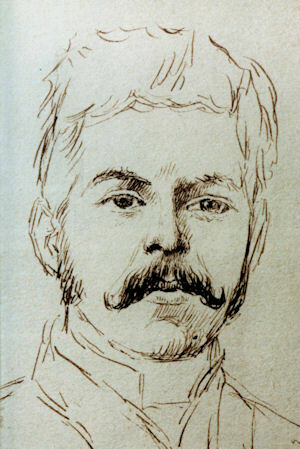 1879 predates the issue of the first illustrated catalogues by ten years so there is no picture of his work. Beyond this the Academy has no additional information about John Hawkins. He was living at 5, Walpole Street, Chelsea. Chelsea is an area of south-west London, England. It had a reputation from a period in the 19th century when it became a sort of Victorian artists' colony. It was known for its haunt of artists, radicals, painters and poets. Perhaps this is why John went there to display and sell his art work. Click here to see a few of John Hawkins' drawings from his sketch book. In 1881 John is back home and is the only child at home. There is no mention of an occupation for James or John. They are living at 50 Clowance Street which is close to where they lived in 1852. John decides to come to the United States. The story passed down in the family is that John came to the United States to represent England in the Worlds Fair but no proof of this has been found. (There was the World's Columbian Exposition of 1893 and the St. Louis Exposition of 1904 which were both after the death of John Hawkins who died in 1892.) 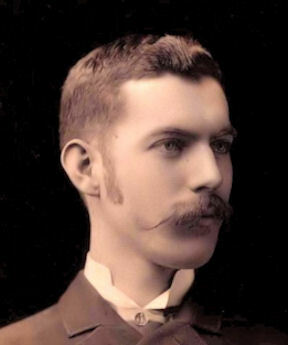 Johns arrives in New York on 16 March 1882 on the ship Italy His departure was from Liverpool, England. 2025 Obear Ave. in the year 2000. James and his mother continue to live together during 1886 and 1887 at the same residence. John has been working in litho and as a draughtsman. In 1888 they move to 4329 N. 20th residence and John is listed as an artist.25 John and his mother move to 2000 John Ave.
M. Coghill who has been living at 2005 Obear Ave. This is not far from the location John's parents lived when they first came to St. Louis. John and Lillie are married 12 February 1889 by R. M. Higgins. Pastor of Hyde Park Congregational Church. Lillie is 20 years old and her father, James C. Coghill's, signature is on her marriage application. 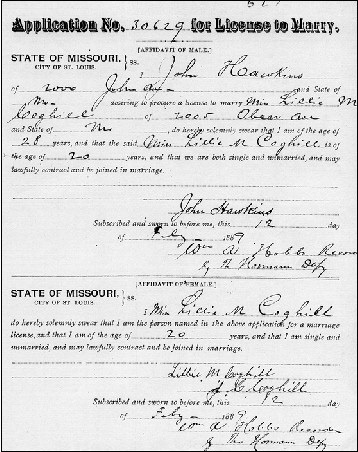 John and Lillie's Marriage Certificate. Her mother has past away before this. John is 28 years old and living at 2000 John Ave.26 Later in the year on 6 Nov 1889 a son, Edgar James Hawkins, is born.27 Later in 1889 they move to 2007 Obear Ave which is close to Lillie's parents home of 2005 Obear Ave. John's occupation is traveler. The 2000 John Ave has been torn down but the 2025 Obear location still exists where John and his parents lived.